As a national uprising grows with the approach of one-man rule, fissures within Haiti’s ruling clique began to appear this week, auguring tumult in the days ahead. On Nov. 18, police fired on a massive march of anti-government protesters in Port-au-Prince, killing two and wounding four. 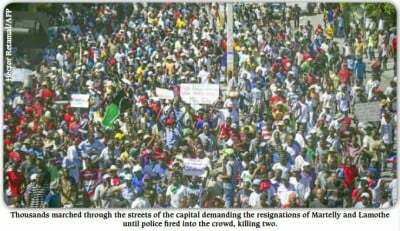 Thousands of demonstrators also marched in other Haitian cities including Aux Cayes, Jérémie, Petit-Goâve, Cap-Haïtien, and Jacmel, calling for the government of President Michel Martelly and Prime Minister Laurent Lamothe to step down. 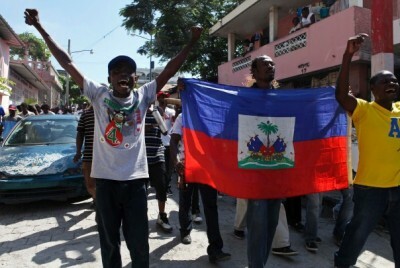 In Port-au-Prince, the demonstration stepped off at 10 a.m. and traveled through La Saline, along Rue Saint Martin to the Péan intersection in Belair, and then to the Delmas Road. But at Delmas 32, uniformed government forces – some say policemen, others say National Palace security agents, still others say pro-government thugs dressed as policemen – fired on the demonstrators, killing two men and wounding four others: Jocelyn Virgil, Réginald Sinace, Pétion Reynel, and Hérard Adner. The names of the two killed were not confirmed at press time. The men who fired the fatal shots were in a jeep with government plates marked SE 02570 and a Toyota Land Cruiser. The demonstration, which had been turning to go to the National Palace, dispersed after the shootings. Significantly, and to the surprise of many, Kiko St. Rémy, Martelly’s brother-in-law, joined the marchers in the capital to demand the resignation of Lamothe, whom he accuses of corruption and ordering the arrest of about 20 demonstrators in the past month. St. Rémy’s presence among the protestors reveals the power struggle now occurring between two cliques in the Martelly regime. The schism corresponds to the traditional rivalry between Haiti’s bourgeoisie and big landowners or grandon (often called, in reference to their armed expression, Macoutes), the two feuding sectors of Haiti’s ruling class over the past two centuries. Dictator Jean-Claude “Baby Doc” Duvalier, who died on Oct. 4, was the first modern Haitian ruler to fuse the rival ruling groups into a “Macouto-bourgeoisie” during his reign from 1971 to 1986. He married a bourgeois princess, Michèle Bennett, and gave her family and sector lots of favors, primarily through promoting the growth of Haiti’s assembly industry. But Baby Doc also kept a foot in the camp of his mother, Simone Ovide Duvalier, and the Duvalierist “dinosaurs,” who were partisans of his father François “Papa Doc” Duvalier, a true representative of grandon rule. Jean-Claude tolerated and took part in many of their feudal ways, like dipping into the millions of dollars in international development aid then being sent to Haiti by the U.S. government and its agencies like the World Bank and Inter-American Development Bank. This corruption is partly why Washington ditched Baby Doc in 1986. Today, Martelly straddles the same divide, with a new but equally fragile version of Baby Doc’s “Macouto-bourgeois” alliance. Lamothe, his long-time business partner, is a pure bourgeois, trained in U.S. schools and management techniques. Lamothe, who built a telecommunications empire in Africa and Latin America, is a darling of the U.S. Embassy, and of U.S. Ambassador to Haiti Pamela White in particular. On the other hand, Martelly’s wife, Sofia, is from the St. Rémy family, who are Gonaïves-based grandons. According to reliable sources close to the family, who wish to remain anonymous, Charles “Bébé” St. Rémy, Sofia’s father, used to be a lieutenant of famed Haitian drug trafficker Jean Eliobert Jasmé, known as ED-One. According to the sources, Kiko St. Rémy has taken over his father’s role as king-pin trafficker. Lawyer Gervais Charles, now an attorney for former President Jean-Bertrand Aristide after previously serving as one for Martelly, says that his former boss “wants to establish a political dynasty.” The idea is to have Martelly pave the way for a Lamothe presidency in 2016, Lamothe a second Martelly presidency in 2021, and then Martelly a second Lamothe presidency from 2026 to 2031. The principal obstacle to this scenario has been six senators in the Parliament – Moïse Jean-Charles (North), Wesner Polycarpe (North), Jean-Baptiste Bien-Aimé (Northeast), Francky Exius (South), John Joël Joseph (West) et Jean William Jeanty (Nippes) – who have withheld their vote on a rigged electoral law and electoral council that would ensure an election victory for Martelly’s candidates (what Haitians call a “selection”). Martelly has refused any compromise on the electoral law and council with opposition legislators during his three and a half years in power, leading to the current stand-off. But the game of chicken comes to an end on Jan. 12, 2015, when the terms of another third of the Senate and all of the Deputies expire, thereby dissolving Parliament by default. From then on, Martelly has indicated, he will rule by decree, an outcome many say he has sought since the beginning of his term. However, as the Kreyòl saying goes, “Ayiti se tè glise,” Haiti is slippery ground. Just as Martelly sees one-man rule within his reach, a popular uprising of disgust at his regime’s corruption and repression, which has been simmering and sputtering for years, is erupting. Meanwhile, Lamothe has openly begun his presidential campaign on social media and in tours around Haiti, thereby alarming his Macoute sector rivals that they will soon become even more marginalized. A conflict within the ruling class, like that which Lenin foretold and which is emerging in Haiti today, provides precisely the kind of historic opportunity for the masses to bring political change. Although popular and opposition forces have been kept down and off-balance until now by Martelly’s money, guns, and propaganda, the days and weeks ahead will tell whether the masses’ superior numbers can perhaps win the day.